As we mentioned over the weekend, fixing the Monk's Abbot quest glitch in Fable II was a priority for the team at Lionhead, so we got in touch with Lionhead Community Manager Sam Van Tilburgh to see how that was going. The good news is that the issue has been fixed! We're keeping a close eye on our forums, while a lot of the issues reported are not issues with the game necessarily, some of them are (like the two examples mentioned in my blog) however and so we're looking at those, plus some (like the Abbot Quest) have been fixed already. The biggest issue is when people report a show stopping issue on our forums without enough information for us to reproduce it. Regarding the ETA for said patch, there is no news yet. The issue with missing DLC codes from the LCE will be resolved tomorrow (28th October). As a person who bought the Fable II Collector's Edition without the code included, I am overjoyed at the fact that I can finally replace my character's pink and black assassin's outfit with medieval Master Chief Armor. 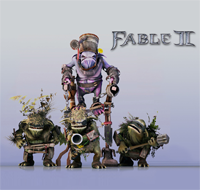 And just in case that isn't good enough news, the Fable II Development Blog is also going to be posting codes throughout the week that players can snag in order to download the Fable II Pub Games for free! They've already posted the first five codes, which have no doubt all been redeemed by now. Seems a bit of a backwards way to distribute them, but free is free.